A lovely car to drive but thirsty for petrol. It averaged 22 mpg. I improved this to 24 mpg by fitting the overdrive gearbox which is a straight swap (but use its own mounting bracket - it's a different shape). The two Stromberg carburettors suffer from split diaphragms so keep a spare in the car. ... and this was the result. The wiring behind the dashboard was burned out so we towed it back from Darlington to Gill's parents' house in Middlesbrough. The guy towing me (the seller) had no idea how to tow and I had my foot on the brakes for so long that the disc calliper seals melted. Brake fluid squirted out and ignited on the red hot discs. So each time I pumped the brakes, jets of flame came out! When we arrived, the towing vehicle stopped and the Triumph ran into the back of it because the brakes had failed completely. There, that looks a bit better. I removed the burned material and glued 12 mm sound deadening fibre material in its place. On top of that I pinned blue lace material. Very pretty and quiet, too. I got the dashboard part of a wiring loom from a scrapyard and spliced it into the existing loom after removing the burned section and all the instruments. Then I stripped the burnt material off the metal dashboard and glued foam rubber on with imitation black vinyl on top. With the instruments replaced it looked as good as new. I replaced the front door panels with a pair from the scrapyard but I couldn't get front seats. So I hid the damage with imitation sheepskin covers. Once the car was driveable, I took it for an MOT test. I asked the mechanic if he thought the acceleration was poor but he thought it was OK. It seemed poor to me as I had to climb some hills in first gear! I removed the cylinder head and everything looked fine so I thought that the sluggish performance was a result of the weight of the car. 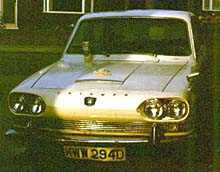 After all, it had a 2 litre straight six engine and weighed well over a ton. So, while the engine head was off, I had thirty thou skimmed off it and then I did a bit of gas flowing, smoothing all the sharp edges, and ground in the valves. The compression ratio was now around 10:1 and I expected a significant increase in power. No such luck. It was slower than a Sherman tank. Eventually I noticed that three spark plugs were brown and three were white. When I checked, I discovered that the rubber fuel pipe to one of the two Stromberg carburettors was blocked. I unblocked it and drove away with a lot of smoke from the tyres, leaving long black marks on the road. 0-60 in under 12 seconds. That felt better! The outer headlights had a dipped beam. The inner two didn't. So I replaced them with the outer type and had four dipped beams! I'm not sure that it was legal but I never got stopped and the alternator seemed to cope OK. I could certainly see a lot better at night!